The Favorites functionality in Compass allows you save both individual records and searches. Here's how! 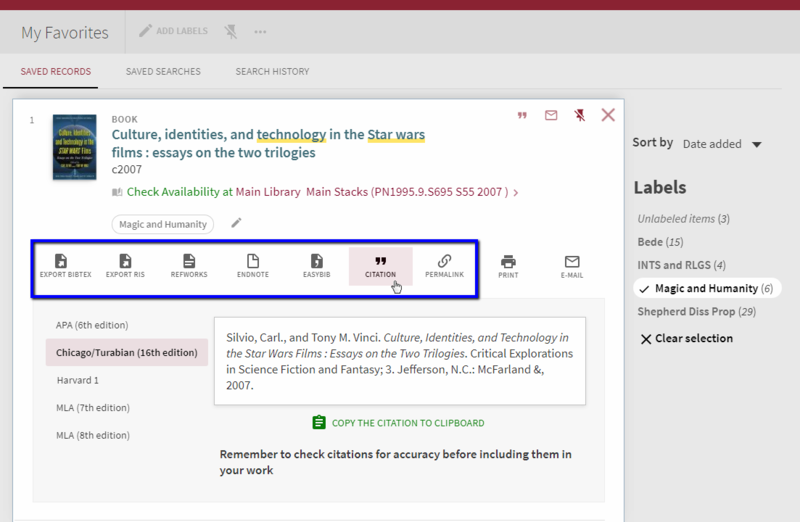 Want to save library records that you find interesting, export them to RefWorks, or email them to someone? Compass makes it easy! You'll start by logging into your library account using the "Sign In" or "View Library Account" links appearing at the top right of every library page. Once you are logged in, perform your research as normal. 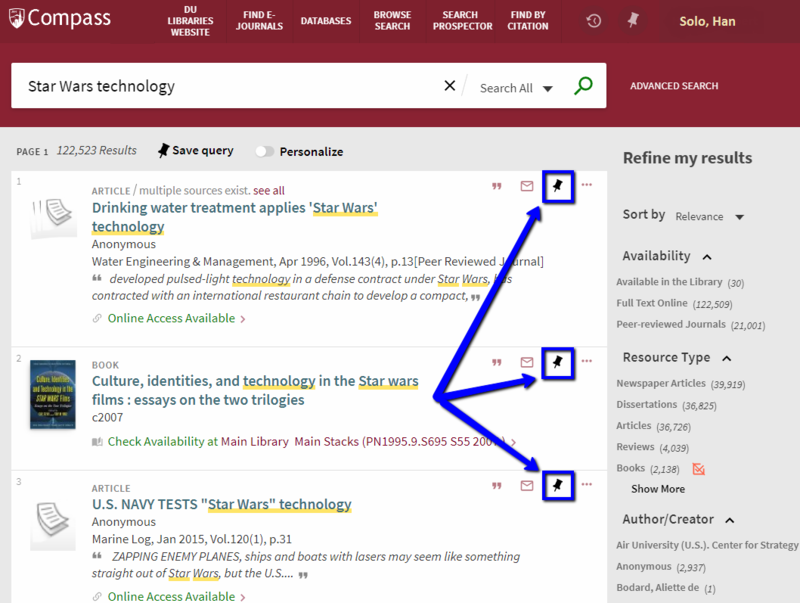 When you come across items that you wish to save to your Favorites (formerly "e-Shelf"), click on the appropriate pushpin on the right side of the enumerated result. You'll have to repeat this process for each record you wish to save. An animation will occur, indicating that the item has been added to your Favorites. Items can also be saved if you've clicked on the full record for the item. Again, use the pushpin in the top right corner. To access the items you've saved, click on the pushpin to the left of your name in the Compass menubar. By default, items saved to your Favorites will be uncategorized. 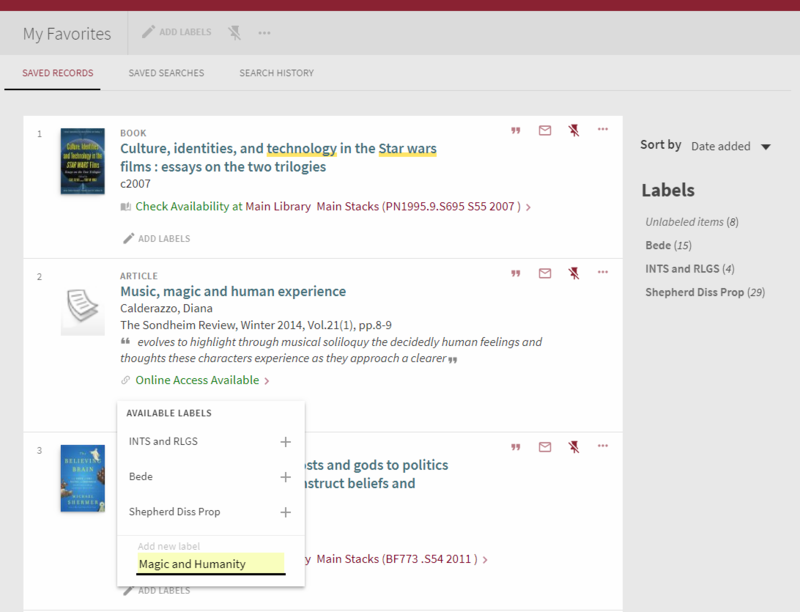 However, you can add labels to your items to categorize them by topic, class, paper, etc. You can either use a label you've previously created, or start a new one. If you don't want to export your Favorites, that's fine too! As long as you are signed in to your account, items placed in your Favorites will be there the next time you sign in to view them. Additionally, Compass allows you to save individual searches. This does not guarantee that the results you see in one month will be identical to those you see a few months from now; rather, Compass only saves the search string to perform it again at a later date. However, this is particularly useful for advanced researchers working on theses, dissertations, or prolonged projects intended for publication, so as to catch new scholarship that may be relevant to their topics. 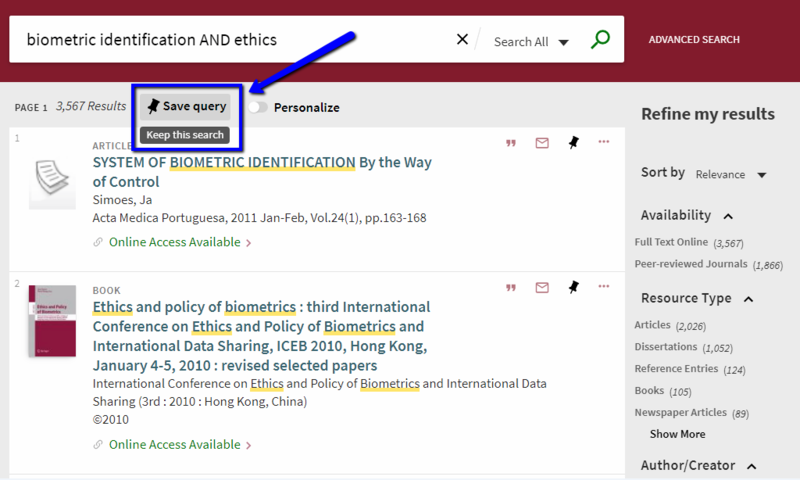 To save a search, look for the "Save query" button immediately below the search bar. The search will be immediately added to the "Saved Searches" portion of your Favorites menu, from which you can set up automatic email alerts or an RSS feed to notify you of new items.